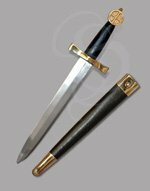 The Celtic Dagger is 14 1/2 inches overall with a 9 inch stainless double edge dagger blade. 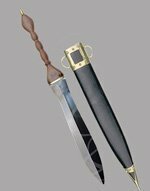 Black leather covered handle. Sculpted pewter guard and wheel pommel. Pommel has red jewel inset. 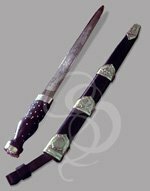 Matching leather covered scabbard with sculpted pewter trim. Ordered one for myself for my aunts wedding. Very nice dagger. Shiny, no sharp edges when I got it. Engravings are easy to see and very pretty. I ordered several of these as groomsmen gifts for my wedding. Since I was buying several, I was able to take advantage of the free shipping for orders over $150. 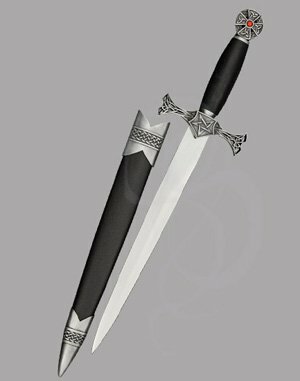 There was a very slight delay on the shipping, but when I called Strongblade, everyone was both incredibly friendly and helpful. As it turns out, the delay was because QA caught an issue and they didn't want to send out a product that was not up to snuff. 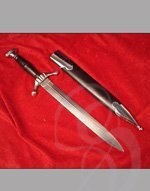 I inspected each of the daggers before giving them out and the quality fantastic. They were a worthy gift for such an important occasion and I was glad I had gone ahead and ordered one for myself, as well. Thank you, Strongblade for delivering such a fantastic product AND a wonderful experience. I would be thrilled to shop with you again!